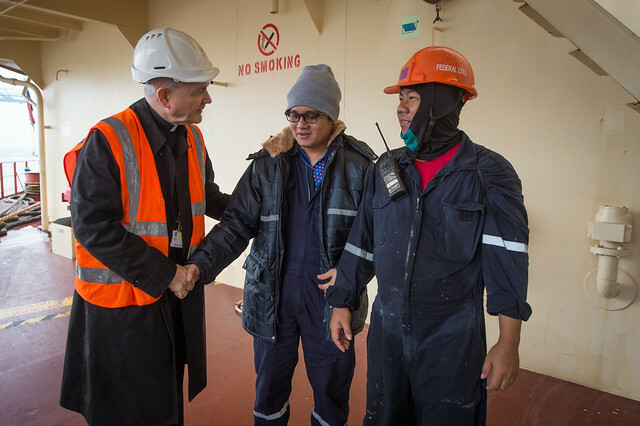 Archbishop Adams visited two ships and met with port chaplain Wojciech Holub and a number of Filipino seafarers serving on the vessels. The men and women working at the port were delighted to receive Pope Francis’s blessing. The went on-board The Federal Lyra, a bulk vessel carrying grain from Canada. This ship has a statue of Our Lady on the bridge the seafarers call the ‘Mama Mary’ – she guides them on their voyages at sea. The Archbishop also visited the Gerda - a CO2 gas carrier. All crew on board the ships are Filipinos.